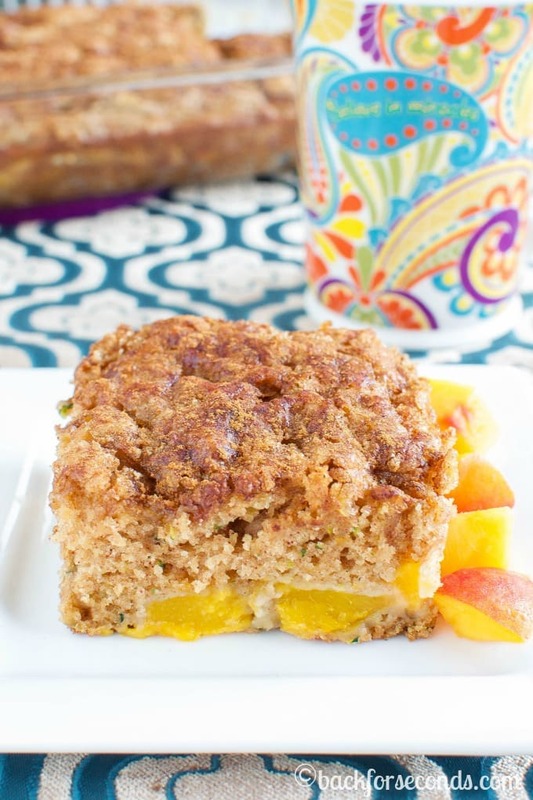 It may sound like a strange combination, but this Zucchini Peach Coffee Cake is amazing! 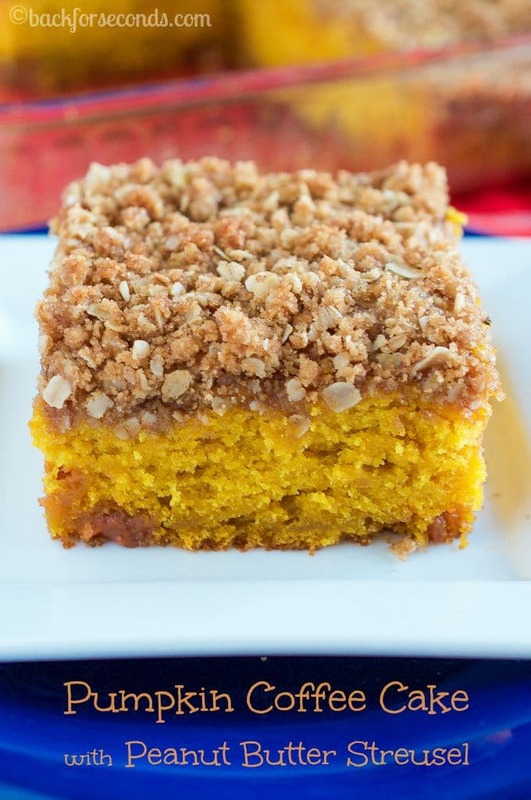 Light, moist, cake with a crunchy brown sugar topping – so good! 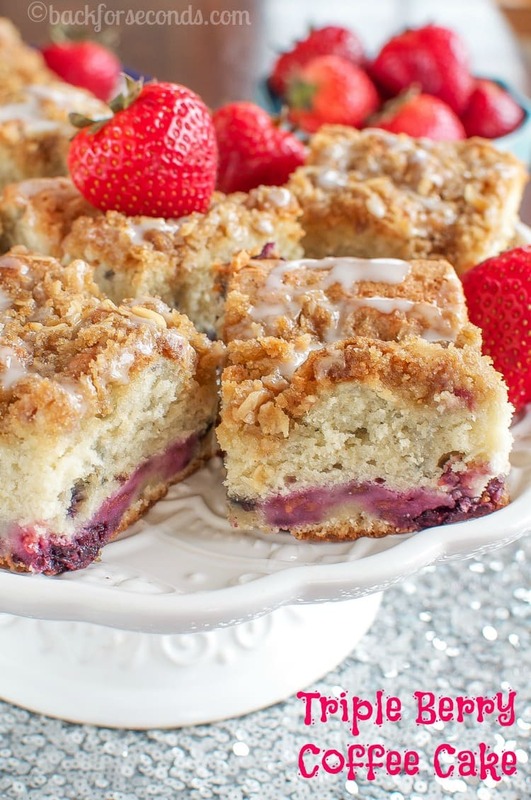 I love a good crunchy topping on my coffee cakes, don’t you? I didn’t go with the traditional streusel this time, but instead did a simple sprinkling of brown sugar and cinnamon. Cinnamon with peaches is absolutely dreamy, and I love the crunch the brown sugar gives when it caramelizes in the oven. 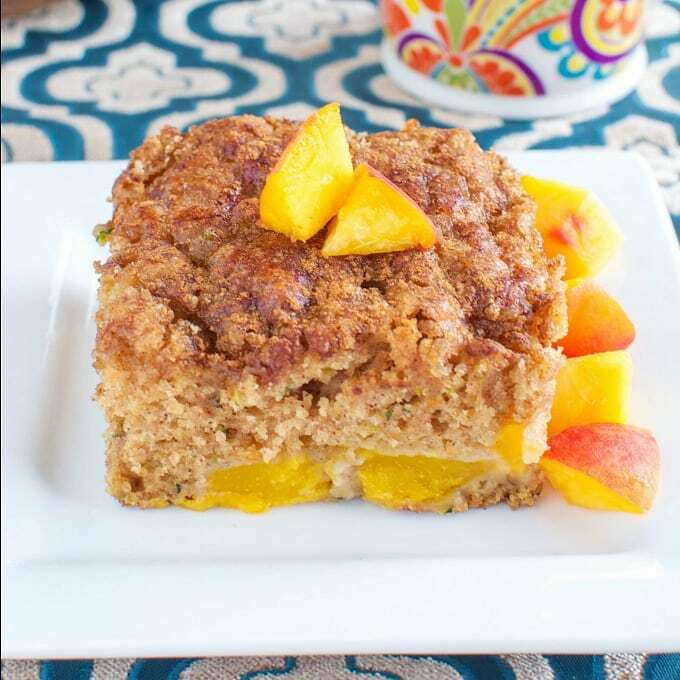 This Zucchini Peach Coffee Cake is a unique and scrumptious way to use the seasons peaches and zucchinis! You will want to make it every summer! 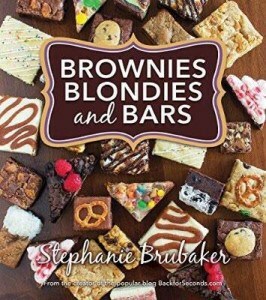 Check out these other coffee cakes too! That looks soooo good and what a great combination! 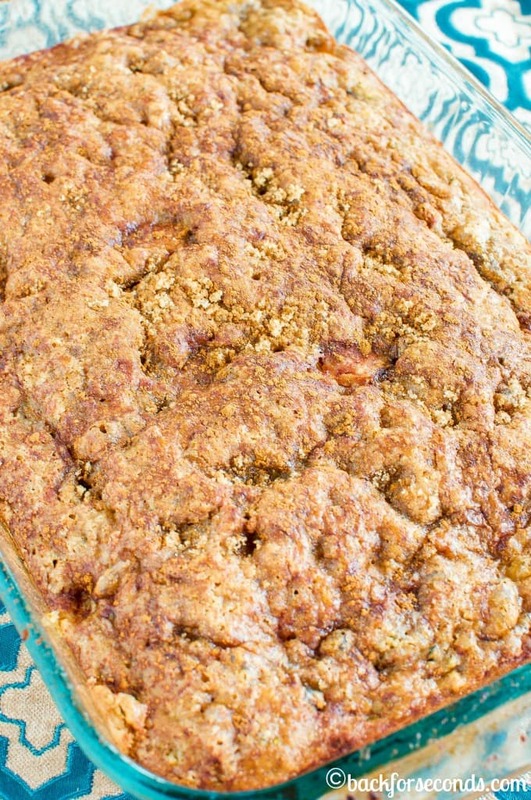 I just finished off some banana zucchini bread, but peach! I love peach, this bread looks so so good! Peaches are one of my absolutely favorite fruits! 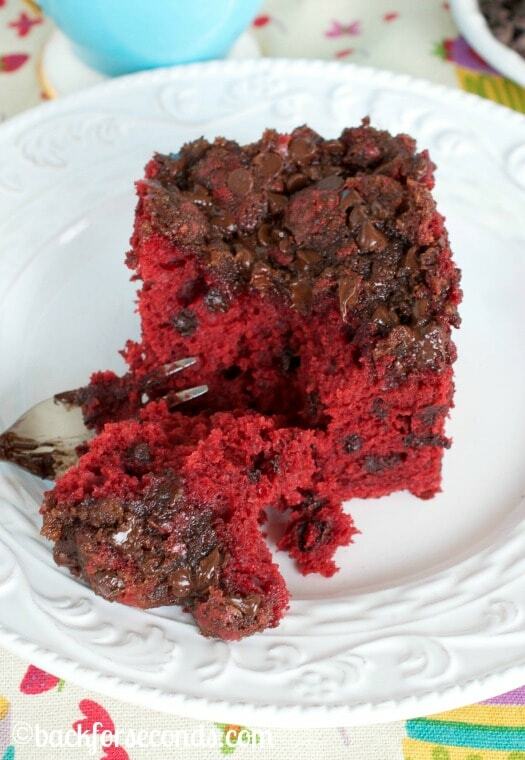 And zucchini added to this cake make it a lovely summer treat!! We love zucchini everything…..and with the peaches this looks SO good! This sounds so delicious and the summer produce in it – love! This looks wonderful! I love zucchinis in baked goods so this looks like a winner! Thanks! I had a big zucchini with a narrow neck so I stuffed the big part & shredded the neck for this, only came to 1c which meant I modified it a bit. I’m also a “opportunist ” baker & use whatever is on hand. In this case, maple yogurt (full fat) that I got free from a store promotion. Replaced all the oil, some of the milk & sugar with it. Any more moist & it t would be mush! But tasty, recommend removing from pan ASAP. I didn’t & bottom got a little soggy. I have 2 volunteer peach trees, cling fruit so I don’t enjoy canning them. Always looking for recipes. I used the smaller ones that tend to be less sweet & juicy for this. 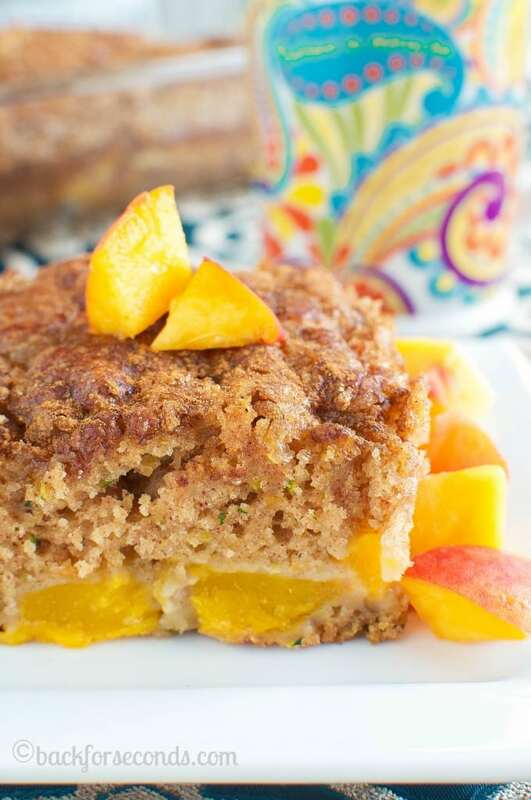 Right amount of sweetness for coffee cake, brown sugar enhances peach flavor. And I added my favorite spice, mace, to chopped peaches while I mixed the rest. 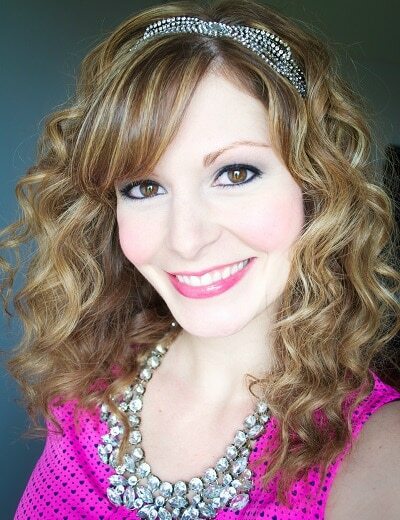 I just made this recipe with fresh palisade peaches and I can tell you that it is so great! If you haven’t tried yet, don’t wait!